I am pleased to announce that Dominican Liturgy is making available on our left sidebar an Index of the Antiphons found in the chant books of the Dominican Rite. This index will be useful for those seeking the Dominican music for antiphons to use in the new Roman rite, as well as those who want to compare the Dominican music with Benedictine, Roman, or other Latin religious order Rites. 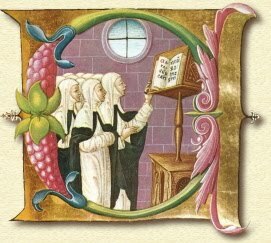 The closest relative to Dominican chant is that of the Premonstratensians, both of which are derived mostly from Cistercian models. Modern Roman-Benedictine chant books often have indices for the various chants, but the most important Dominican chant books for the Office—the Antiphonarium of 1863 (with night office), the Antiphonarium of 1933 (no night office, post-Pius X psalter), and the Matins book of 1936 (major feasts)—have never been indexed or the index is found in a separate, hard-to-find, pamphlet. All the antiphons of these books are in our new index. This index also includes all the antiphons found in the Dominican Processional, the Holy Week Books of 1949 and 1963, the Gradual, and the Compline book. The links to the index are available at Dominican Liturgy on the left sidebar, under "Dominican Rite Texts—Downloadable." One version is numbered straight through, the other formated to print as a double sided booklet. Note: The Dominican cloistered sisters of Prato (the community of St. Catherine de' Ricci, O.P.) are wearing white veils and no scapulars because they were and are technically members of the lay penitents ("Third Order"), not nuns ("Second Order").